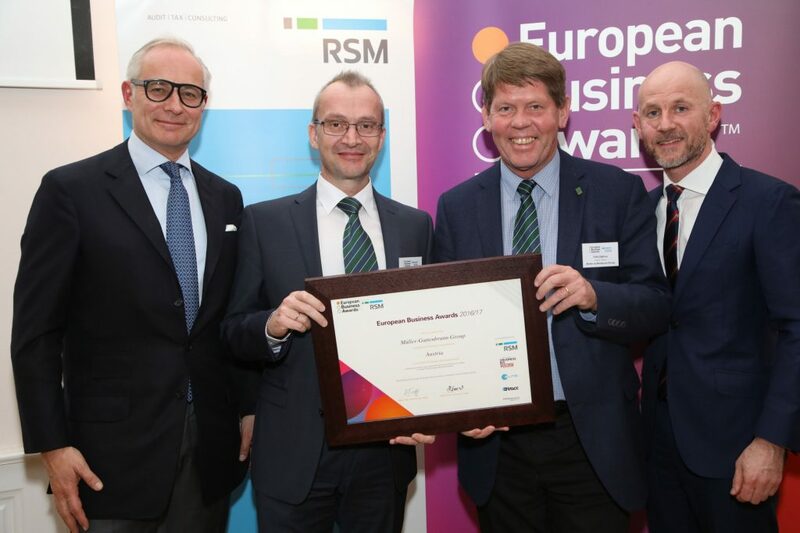 The Müller-Guttenbrunn Group was awarded with the title „National Champion“ at an event of the European Business Awards on January 17th 2017. CEO Christian Müller-Guttenbrunn and Chris Slijkhuis were delighted to receive this wonderful recognition at en event in Vienna. People globally watched videos of all the competitors at www.businessawardseurope.com and voted between 9 January and 1 March this year. The film of the Müller-Guttenbrunn Group can still be watched by clicking www.mgg-recycling.com/eba This three and a half minute long film was voted for 323 times and Müller-Guttenbrunn received many positive reactions on this home-made video. Indeed the film script, the filming, the editing and the production of the film was all done in-house. With the huge competition it was already clear that the chances of winning would be remote and indeed the number of 323 votes did not suffice to become public vote winner. “It has not only been a great exercise to participate in this public voting and has also been great fun. Even today I get thumbs-up walking over the Müller-Guttenbrunn premises” says Chris Slijkhuis wo managed this PR Project.